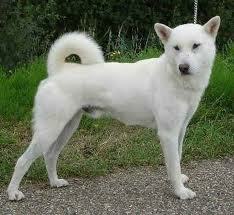 Kishu Ken is a Japanese breed of dogs where it is given the status of a National Treasure. It is named after the Kishu region, presently the Wakayama Prefecture. Due to its similarity with Hokkaido and Japanese Spitz, it is often mistaken to be a white variant of either of the two breeds. In earlier times, Kishu Ken was considered important because of their ability to hunt deer and wild boars. However, in the present times the breed is used simply as a companion or for herding cattle. It is a rare breed and is hardly ever exported outside Japan. It is a medium size dog, strong and well built, has energy, bravery, dignity and patience along with being lively, attentive and noble, loyal, devoted and intelligent. The Kishu Ken breed is not recommended for novice as they are stubborn and independent and need a tough handler to be able to train them well as an early age. They need dignified, strict, just and continuous training and would not reply to harsh methods. Kishu Ken breed bond well with one member of the family and will get along with children and dogs that they have grown up with. However, animals which have cats or other small household pets can not keep Kishu Ken because of their high prey drive. They are a quiet, intelligent and gentle breed who becomes alert but not fierce around strangers. The Kishu Ken is a double coated breed and a heavy shedder because of which brushing on a weekly basis is necessary to keep the coat free of matting. They should be bathed when needed and their nails trimmed and ears checked on a regularly basis. Kishu Ken is not apt for apartments as they need exercise and enjoy long jogs, hikes, walks and herding. Thus it will be best in a rural environment or a large fenced in area. Kishu Ken is a relatively healthy breed and there are no known health issues because of the rarity of the breed. It may live on an average for 11 to 13 years but most survive up to the age of 15 years.